The post EOS Price Analysis: Platform Top-rated, But Will Prices Rally? appeared first on Ethereum World News. by CMC’s new partner, a blockchain analytic firm, Flipside. Wanchain’s next blockchain bridge will be #EOS! This integration is already in-progress and will be complete in Q2, making EOS and its powerful network of dApps fully inter-operable with the Bitcoin and Ethereum blockchains. Welcome @block_one @brockpierce @eosnewyork @LiquidEOS! EOS—ranked as the best platform by China’s CCID. At the time of press, EOS performance is stellar and prices are up 1.9 percent in the last week with EOS changing hands at around $3.6 apiece. Even so, we should note that this could as well be a deserved correction and as price action dictates, a period of extended losses or gains should be followed by a correction. From the charts, it is clear that EOS is correcting and our resistance as laid out in the chart has been marked by a humongous bear bar. 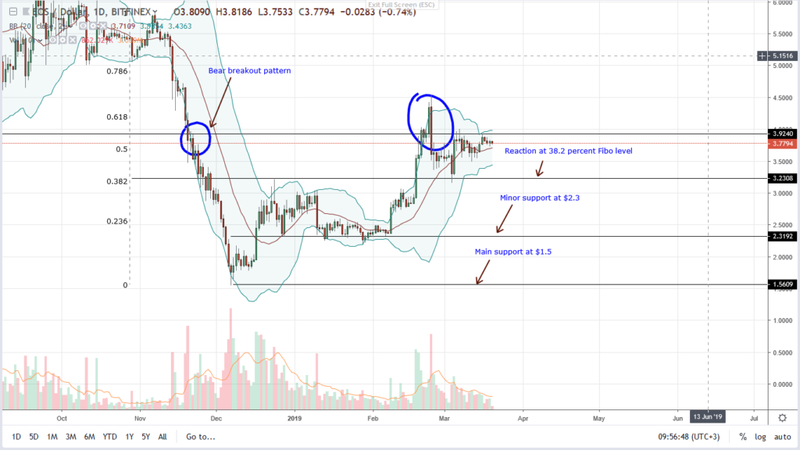 losses of Feb 24 is bearish for EOS. in that case, EOS must print above $4.5. recent averages confirming liquidation of Feb 24.